The Robert and Carol Morris Center for 21st Music is pleased to announce a very active 2011-2012 season, which has already kicked off to an exciting start with last Thursday’s concert, “Secret Messages,” where members of The Genkin Philharmonic performed works by UB’s own Moshe Shulman and Jeff Stadelman, as well as works by Morton Feldman, Milton Babbitt, and Iannis Xenakis. Jon Nelson and The Genkin, as always, provided us with a beautiful and well-crafted program, with members of the ensemble improvising between pieces to create a seamless and absorbing flow of music. The upcoming week will be a vigorous one for the Slee Sinfionetta, as they tour a program of music by some of today’s best composers to Buffalo, Cleveland, and Pittsburgh. The excitement begins at UB’s Slee Hall on Tuesday at 7:30 p.m. with works by Erb, Rindfleisch, Rosenblum, D’Alessio, and Felder. The tour will then continue to Cleveland State University on Wednesday and to the University at Pittsburgh on Friday. The Slee Sinfionetta will be under the baton of James Baker and guest conductor Andrew Rindfleisch, who is currently a Professor of Music and the Head of Music Composition Studies at Cleveland State University (click here for more information about Andrew Rindfleisch). 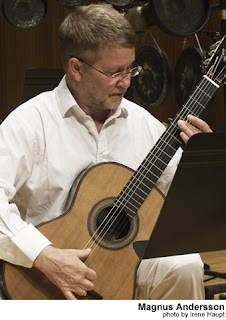 The Slee Sinfionetta will also be joined by internationally renowned guitarist Magnus Andersson, who will perform on David Felder’s Requiescat. The activity continues throughout September as UB music faculty participate in President Satish K. Triparthi’s Investiture Week, with clarinetist Jean Kopperud performing Sep. 19th at 3:00 p.m. for the Annual Celebration of Academic Excellence at the Center for the Arts. The week will conclude with a university-wide ceremony on Friday, Sep. 23rd at 3:00 p.m., also at the Center for the Arts, where Carl T. Hayden, Chairman of the State University of New York Board of Trustees, and SUNY Chancellor Nancy L. Zimpher will formally invest President Tripathi with his new office. During the ceremony we will be treated to a performance of David Felder’s “Funfares,” a new work written especially for the investiture of UB’s new president. The month will conclude with Magnus Andersson returning to UB on September 28th, to lead a composer master class and workshop pieces by Dan Bassin, Nathan Heidelberger, and some of UB’s incoming graduate composers. On the following evening, Sep. 29th, Magnus will pair with fellow guitarist Arturo Tallini for a concert in Baird Recital Hall at 7:30 p.m. The rest of the fall semester will be packed with visits from the contemporary music scene’s leading ensembles, singers, conductors, and composers. On October 18th acclaimed brass quintet The Meridian Arts Ensemble will lead a composer workshop with UB’s graduate composers, and on November 1st the Slee Sinfionetta, conducted by Gil Rose and featuring mezzo-soprano Julia Bentley, will give a concert featuring works by Pulitzer Prize-winning composer Bernard Rands. Bernard Rands will be staying in Buffalo and presenting a guest lecture to the music department the following day (learn about his recent projects here). The semester will begin wrapping up on November 15, when the Bonne Action Contemporary Music Ensemble will put on a concert of contemporary music in Lippes Concert Hall. Next Spring at The Center for 21st Century Music will be just as active as the Fall, as we will be welcoming the return of Mathias Pintscher to conduct the Slee Sinfionetta on April 3rd. Many other distinguished performers and composers will be visiting the Center as well, including distinguished Mozart scholar and pianist Robert Levin and Italian virtuoso flutist Mario Caroli. There will also be several composer workshops featuring works by UB graduate composers, including the Antares New Music Quartet and the Talujon Percussion Ensemble. The season will conclude explosively with June in Buffalo 2012, which promises to be one of the largest and most exciting contemporary music events of the year. This year's festival showcases an incredible cadre of faculty composers: Louis Andriessen, Robert Beaser, Steven Stucky, Fred Lerdahl, and David Felder. June in Buffalo 2012 will also feature an all-star lineup of ensembles and soloists, including CIKADA, Ensemble Interface, New York New Music Ensemble, SIGNAL, UB Percussion Ensemble, Slee Sinionetta, and the Buffalo Philharmonic Orchestra. Special guests James Baker, Roberto Fabricciani, and Brad Lubman will also participate in the festival this year.